Drug-free, more natural pain relief during labour. Hire period is for 4 weeks with an optional free 2 week extension should you go over your due date. Reserve your rental now and the unit will be dispatched around 3 weeks before your due date (please note this when selecting your delivery options at the checkout). The unit can also be used for relief from back pain from 37 weeks into pregnancy. Please ensure that you test and familiarise yourself with your unit before you go into labour (use from 37 weeks onwards). The MamaTENS really helped me. I had a lot of back pain during my labour and TENS really helped me deal with the pain levels. The service was excellent - easy ordering and delivered on time - I would highly recommend using one in labour. The new pads arrived for my TENS machine 2 days after ordering! It will be my second time using the machine and I highly recommend the MamaTENS in labour if you want to keep it as natural as possible. 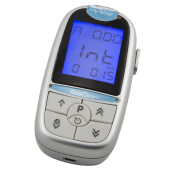 The TENS machine arrived on time and everything was self explanatory and simple to use. I used it throughout my labour and certainly got the benefit of it. Very happy to recommend to it. Great device and excellent service. Really easy to arrange and I would definitely recommend this.